Having grown up on a small holding on the Channel Island of Guernsey, Daniel had always sought out ways to be in, and connect to, nature. This has been coupled with an equal interest in connecting to humanity and has resulted in a wide spectrum of outdoor work; various gardening and agriculture, social care work; mental health support and live-in care with tetraplegics, university studies; Geological Oceanography BSc and Applied Marine Science MSc. All interspersed with healthy doses of traveling, including cycling solo to Morocco. 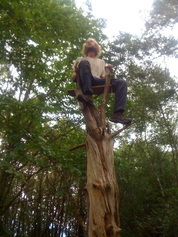 This has all led to Daniel living in a self built tree house on a community biodynamic farm since 2009, which is when he also embarked on a once-a-month year course in nature connection and primative skills at Trackways on Sussex. Since then he has attended three UK Art of Mentoring week long gatherings where he deepened his understanding of nature and community connection. He has been facilitating groups of children and adults in their personal nature connection journeys for over five years. Recently he had travelled for three months along the West coast of the US visiting other nature connection organisations for a cross cultural exchange and bringing back inspiration to enrich his work in the UK. Daniel has been running short courses with adults through the International School of Storytelling for the past three years. He had himself been a student of the school and weaves storytelling throughout his work. In 2017 he ran a weekend adult program in the Czech Republic which is leading on to more courses there in 2018. He is very excited at the initiation of this adult course to share more of his understanding of connection to oneself, each other and nature through the experiences he has had.